After a divorce, parents do not always agree on many things when it comes to their children. This can become a serious problem if the child requires medical attention or some form of intervention and the parents cannot agree on how the child should be helped. In these cases, it is always best to make sure that there is a court order in place governing how the parents should proceed. Generally, the parent who has primary custody of the child is granted the right to make medical decisions for the child. This means that this parent may consent to the child receiving ongoing medical care as well as emergency care. 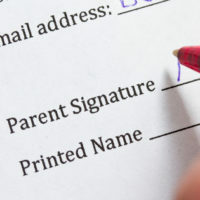 However, the parent cannot use that authority to authorize unnecessary medical procedures. The other parent would likely contest to the child getting the medical care if that parent feels the care is unnecessary. However, if the need for the child’s care is documented by medical professionals, then it is more likely to be upheld in court. In some cases, children whose parents get divorced may need counselling in order to cope with the divorce. If one parent does not believe in counselling, the parent may not want the children to receive the care they need. The same may be true if a child is diagnosed with a learning disability or a mental illness; a parent who is in denial about the child’s condition may oppose treatment for the child. The parent may also refuse to administer medication during the parent’s parenting time. Custodial parents who suspect that the other parent will interfere with the medical or counselling needs of the children can request that a judge require the other parent to comply with the child’s medical plan of treatment. If a parent continues to ignore the court’s order and refuses to give a child medication or take the child to medical or counselling appointment, the court can step in and act in the best interest of the child. This could mean that the parent who is actively interfering with the child getting treatment may get reduced visitation or supervised visitation. Parents who have the right to make the medical decisions for their children should try their best to include the other parent where possible and appropriate. Involving the other parent in counselling appointments, informing the parents about medication that is prescribed and how to administer it, and other such issues could make it easier for the parent to provide the care the child needs during the parent’s parenting time. However, if for example a child is receiving counselling for being abused by a parent, it may be better to keep that parent out of the child’s counselling sessions. It may be necessary to get a court order to keep the parent away. If you are getting divorced and want to find out more information on how we can help you with your child support and child custody issues, contact us at Barbara Flum Stein & Associates serving Delaware County in all family law matters to schedule a consultation.